Pet Filling Machines|Filling Machines|manufacturers and suppliers in Mumbai, India. Supplier & Manufacturer of Pet Filling Machines. Our product range also comprises of Heat Shrink Tunnel Machines, Shrink Tunnel Machines and Shrink Tunnel Heavy Duty. 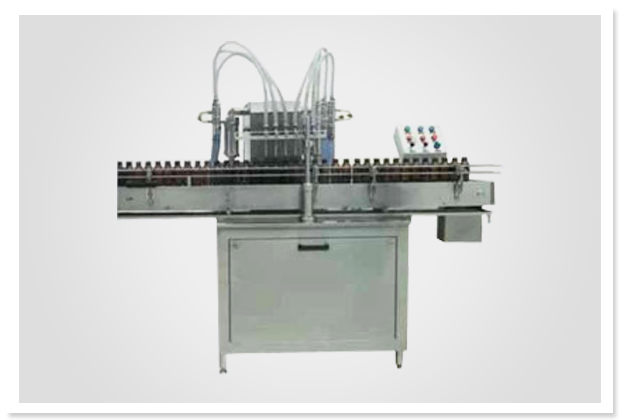 Fully Automatic Volumetric Four Heads and Six Heads Liquid Bottle Filling Machine. It is Suitable for filling products like Pharmaceuticals, Pesticides, Cosmetics, Beverages etc. in Flat/Oval/Square/Round shaped products having PET, Plastic, HDPE, LDPE, Glass or any other surface. All Contact parts and Syringes made from S.S 316 Material. No Container No Fill system. With Built In Turn Table. Very High Fill Accuracy of ± 1% in Single Dose. MODEL CONTAINER IAMETER CONTAINER HEIGHT FILL RANGE OUTPUT B.P.M. SBLF-100 30mm to 100mm 210mm Max 30ml to 500ml Max.100 B.P.M. (with the help of change parts) Max.150 B.P.M.